Displaying an elegant pattern the emulates a sense of majesty, the Mercury collection by Surya is brimming with beauty and grace. 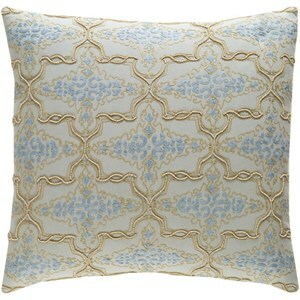 Woven in India with 100% cotton, this stylish yet sophisticated piece is perfect for adding charm to any room. 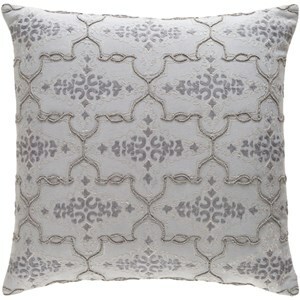 Complete your look today with this exclusive pillow, it will add a sense of majesty to your home! The Mercury 18 x 18 x 0.25 Pillow Cover by Surya at Hudson's Furniture in the Tampa, St Petersburg, Orlando, Ormond Beach & Sarasota Florida area. Product availability may vary. Contact us for the most current availability on this product. Browse other items in the Mercury collection from Hudson's Furniture in the Tampa, St Petersburg, Orlando, Ormond Beach & Sarasota Florida area.